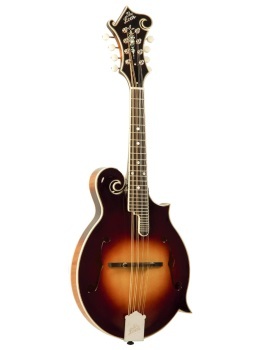 Hand-carved and graduated from solid select tonewoods and featuring a lightweight nitrocellulose finish for incredible projection, The Loar’s LM-600 Professional F-Style mandolin is an accurate replica of an original 1920’s F5-style model. The hand-buffed tobacco sunburst finish with nitrocellulose lacquer provides a vintage sheen and an authentic pre-war-style bark that will impress even the most avid vintage purist. The LM-600 features a solid hand-carved spruce top, solid hand-carved figured maple back and sides, a one-piece maple neck with rounded â€˜V’ profile, bound ebony fretboard and an abalone and mother-of-pearl custom flower pot headstock inlay.